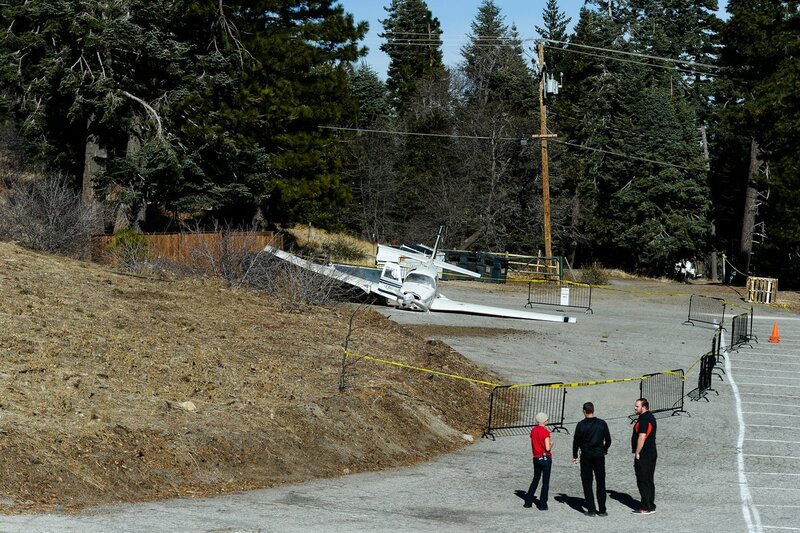 The private pilot reported that, a few minutes after departure for a cross-country flight and as the airplane neared the top of a ridgeline, it encountered a downdraft, aerodynamically stalled, and then impacted terrain. One of the passengers reported hearing an aural tone, which was consistent with the stall warning horn, for several seconds before impact. Weight and balance calculations determined that the airplane was loaded near its maximum gross weight and had exceeded the forward center of gravity limit, which would have increased the airplane's stall speed during the accident flight. The calculated density altitude was about 6,550 ft, which likely reduced the available power and affected the climb rate. A video of the final moments of the accident flight showed the airplane about 25 ft above ground level when the airplane entered a high pitch attitude, followed immediately by a rapid descent, consistent with an aerodynamic stall. 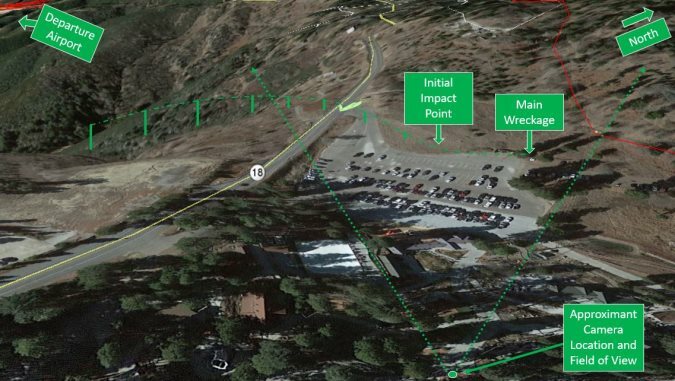 According to the pilot, the airplane was about 1,000 ft above terrain when it stalled; however, given the location of the camera and the pitch attitude that was observed, it is likely that the airplane was within about 50 ft of terrain as the airplane crested the ridgeline. 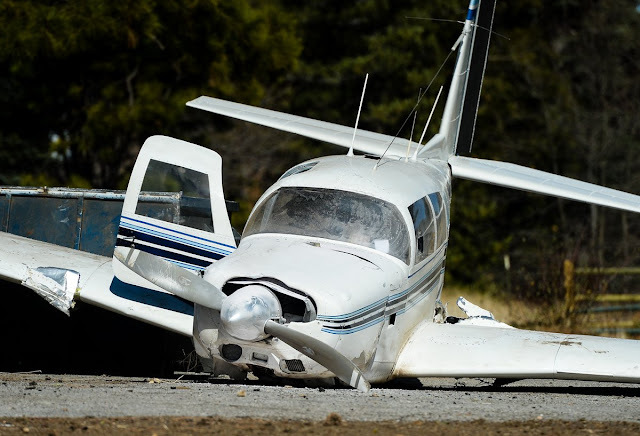 The pilot should not have attempted to cross the ridgeline at such a low altitude; a higher altitude would have provided a clearance zone to avoid turbulence and downdrafts. The pilot's failure to cross at a higher altitude resulted in the airplane's encounter with a downdraft with insufficient altitude to recover from the stall. The pilot reported that there was no evidence of any preaccident mechanical malfunctions or failures with the airplane that would have precluded normal operation. The pilot's failure to establish the proper airspeed after departure and to maintain adequate clearance from a ridgeline in high-density and downdraft conditions and his subsequent exceedance of the airplane's critical angle of attack, which resulted in an aerodynamic stall with insufficient altitude to recover. 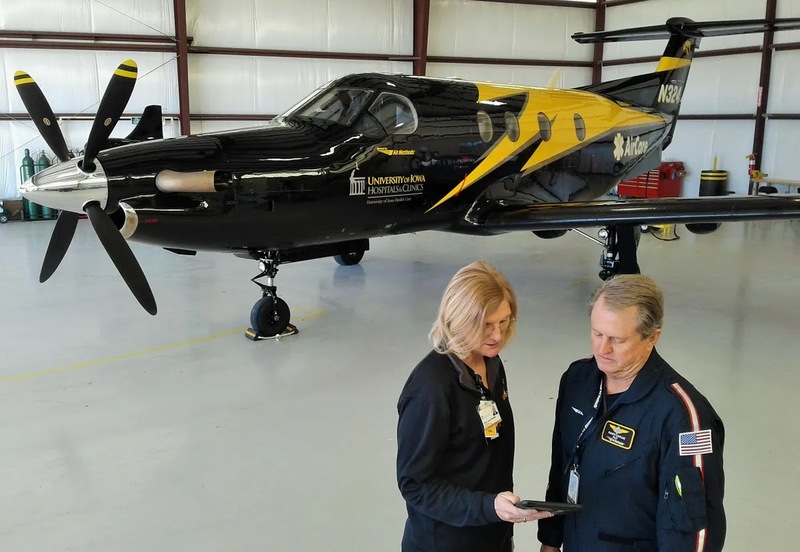 Contributing to the accident was the pilot's inadequate preflight weight and balance calculations, which failed to take into account the gross weight, high-altitude conditions, and center of gravity limit. 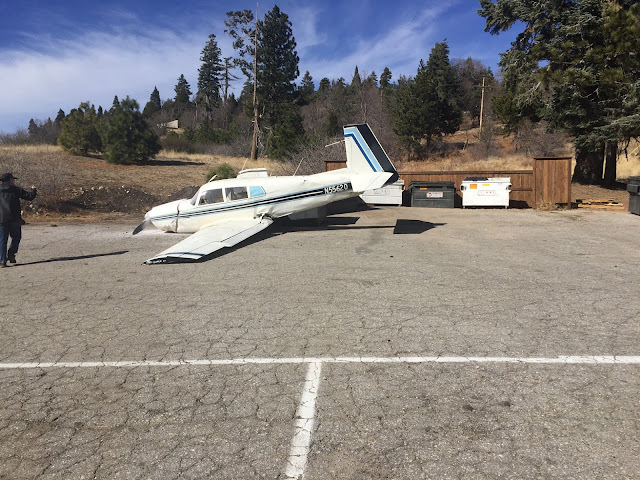 On January 17, 2018, about 1130 Pacific standard time, a Mooney M20E airplane, N5562Q, was substantially damaged when it crashed in a parking lot near Skyforest, California. 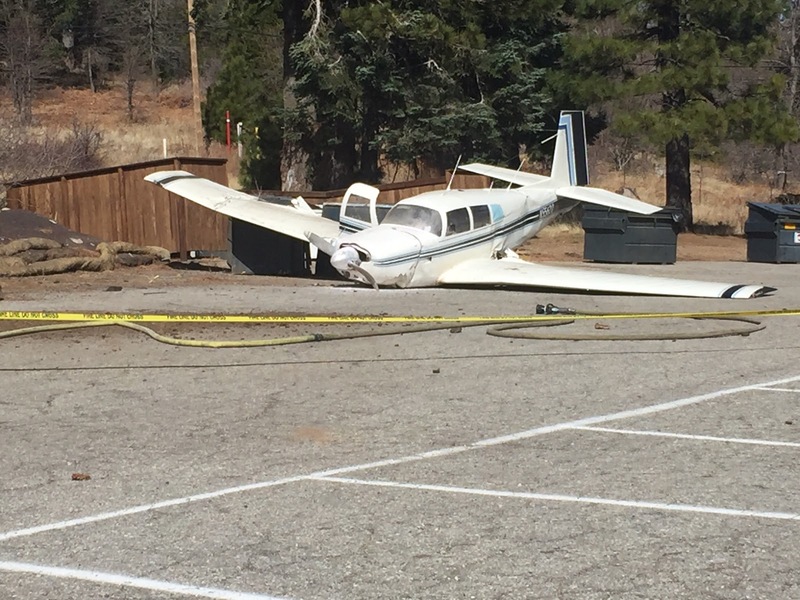 The private pilot received serious injuries, and one passenger received minor injuries; the other two passengers were not injured. 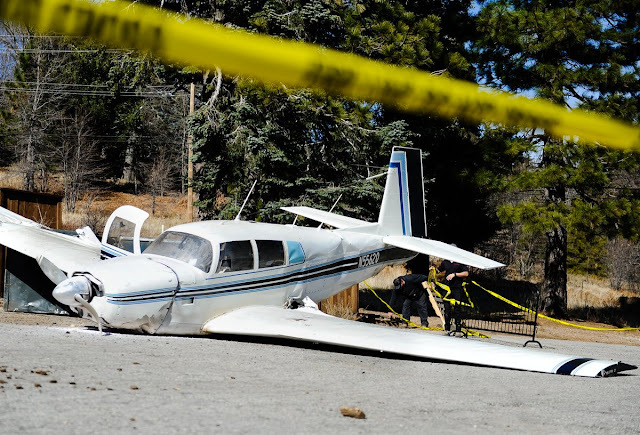 The airplane was registered to Tangobravo Consulting LLC., Redlands, California, and operated by the pilot under the provisions of Title 14 Code of Federal Regulations Part 91 as a personal flight. Visual meteorological conditions prevailed, and no flight plan was filed. The flight originated from San Bernardino International Airport (SBD), San Bernardino, California, about 1100 and was destined for Black Bear, California. The pilot reported that he departed SBD with 20 gallons of fuel onboard. 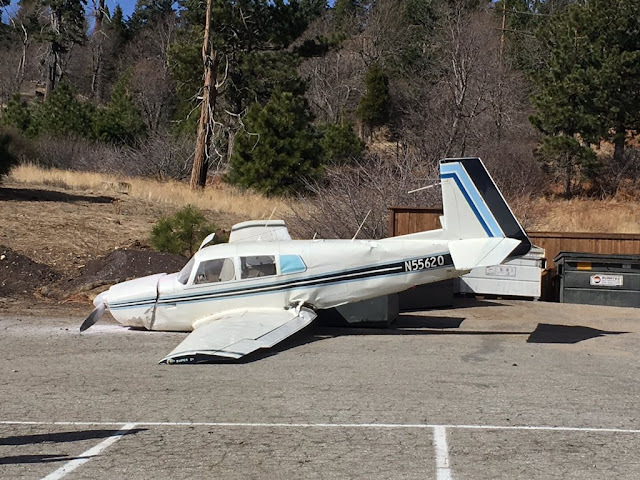 About 5 minutes into the flight and approximately 3 miles northwest of SBD, the airplane approached rising terrain that ascended from about 1,800 ft to 5,700 ft over approximately 5.5 miles. The airplane was about 1,000 ft above ground level (AGL) as it neared the top of the ridgeline. According to the pilot's recount, about that time the airplane encountered a down draft and then aerodynamically stalled, which was immediately followed by an impact with terrain. According to one of the passengers, he heard three lengthened aural warnings prior to impact that were later determined to be the airplane's stall warning horn. The first lasted about 4 to 5 seconds, the second lasted about 3 to 4 seconds, and the third started as they crested the ridge and continued until impact. The pilot did not submit the National Transportation Safety Board Pilot/Operator Aircraft Accident/Incident Report Form 6120.1. The 1149 recorded weather observation at SBD, located about 9 nm southwest of the accident site, included wind calm, visibility 7 statute miles, scattered ceiling 15,000 ft, temperature 23° C, dew point 1° C, and an altimeter setting of 30.19 inches of mercury. The calculated density altitude at the accident site was about 6,550 ft. According to the airplane's most recent weight and balance calculation sheet, the airplane had an empty weight of 1,629.1 lbs., and a maximum gross weight of 2,575 lbs. The airplane's weight & balance was calculated with a pilot and front seat passenger's weight of 380 lbs., a rear seat passenger's weight of 390 lbs., and 120 lbs. of fuel. The weight of the airplane at the time of the accident was about 2,519.1 lbs., and the center of gravity (CG) was about 42.66 inches. "The aircraft stalls at a higher speed with a forward CG location. This is because the stalling AOA [angle of attack] is reached at a higher speed due to increased wing loading." At higher density altitudes, takeoff and landing distances are increased, rate of climb and actual service ceiling are decreased, true airspeed is higher for a given indicated airspeed, and turning radius is larger at high altitude at a given indicated airspeed. To help regain some of the lost takeoff and landing performance at high density altitudes, you should reduce the weight at which you fly the airplane to no more than 90% of maximum gross weight. On most mountain flights, you will need to cross at least one ridge or pass. Experienced pilots recommend crossing a ridge or pass at the ridge elevation plus at least 1,000 feet. If the winds at mountain top level are above 20 knots, increase that to 2,000 feet. Plan to be at that altitude at least three miles before reaching the ridge and stay at that altitude until at least three miles past it. This clearance zone will give you a reasonable safety zone to avoid the most severe turbulence and down drafts in windy conditions. You really can't make this stuff up! Seriously? "a rear seat passenger's weight of 390 lbs." There were two in back.